After I looked up what the top songs were when I was 12 years old, there was a clear winner (because c’mon, I wish I could remember what my favorite song was in 1982). Which for many of us, instantly brings us back to the Rocky movies (the first one was in 1976… who else feels really old right now?). I liked the first few Rocky movies a lot. They are the perfect example of the ‘the hero’s journey’, right? We want to see Rocky triumph. We’re rooting for him. One thing that stands out most in my memories of those movies is when he flies to Russia to train to fight Drago (because Drago killed Apollo Creed in an exhibition match). He new Drago was being trained as an elite athlete in the best facilities but he went to a cabin in the mountains and trained ‘old school’. It was beyond inspiring (what can I say, I love a good inspirational sports movie). He didn’t freak out because Drago was training in a better facility or had better equipment. He focused on himself, on his training… on his ‘why’. If you haven’t thought about your ‘why’ in your business in a while, now is the time. Your daily actions should always be driven by the bigger ‘why’ in your business. Small consistent action will support your ‘why’ more than anything else. Staying focused, day after day, doing the right work. The problem with that in this space is that things change so fast and so often. Just like you I love trying new things (I am hell bent on finding a right fit for FB messenger for my business without making people crazy), but mastering the fundamentals is still at the core of everything I do. 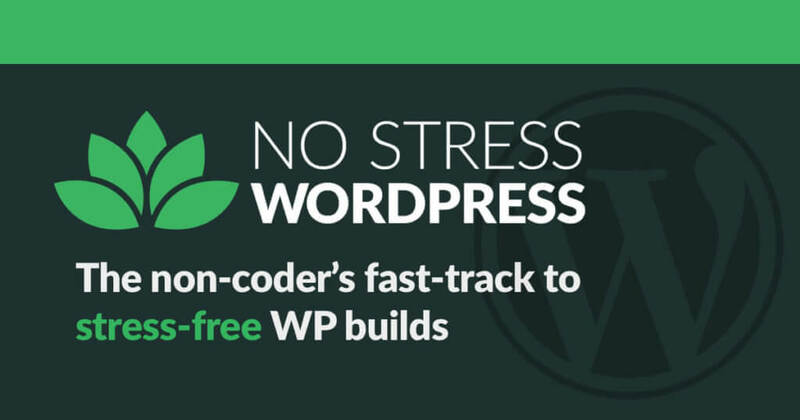 For those of you who build websites or just manage your own and want to “once-and-for-all” dial in your skills, my friend Dave Foy has a great ‘No Stress WordPress’ course for you. He also uses one of the best page builders available, which is Elementor (my top favorites are Beaver Builder, Thrive Architect & Elementor). The price will be going up next time (not sure when he’ll open it again), but you can jump in now & start mastering your own skills!